PhonePe App Refer and Earn Offer – Get 50% Cashback on First & Fifth UPI Transaction + Rs 50 per Referral. 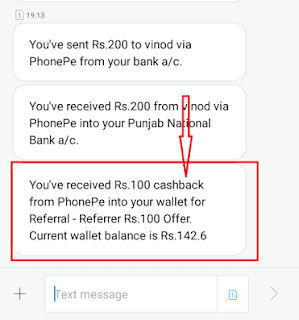 PhonePe App has come up with “Refer & Earn” Program where they are offering 50% Cashback on First UPI Transaction (Max Rs 75) and 50% Cashback on Fifth UPI transaction (Max Rs 50 + Earn Rs 50 per Referral. The Cashbacks will be credited to the PhonePe Wallet within 24 hrs. So Hurry up and avail this Offer now !! 1) First of all, Download PhonePe App Here (Install from this Link to Get 50% Cashback on First UPI Transaction). 7) Make your First upi transaction to get 50% cashback upto Rs 75 and Make Second upi transaction to get 50% Cashback upto Rs 50. 8) That’s it, You will get the 50% Cashback (upto Rs 75) and on fifth UPI Transaction you get 50% cashback maximum Rs 50 !! 1) Firstly goto Menu >> Invite Friends >> Get your Referral link from there. 2) Copy to Clipboard and Share it to your Friends or Family members. 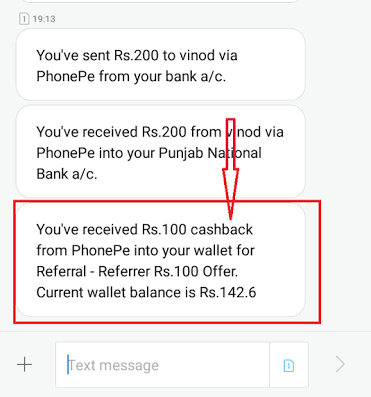 3) Once your Friend Download Phonepe app using your referral link and Make his first transaction, Then You get Rs 50 & Your Friend get 50% Cashback in Phonepe wallet. 1) When a user makes a money transfer using UPI for the first time, the user gets 50% cashback (up to ₹75), and for the user’s fifth ever money transfer using UPI, the user gets 50% cashback (up to ₹50). 2) Offer is valid only on money transfers using the PhonePe app, where money is transferred via UPI to a PhonePe user, or a VPA, or a bank account (using its account number & IFSC code), or money is transferred between the user’s own linked bank accounts. 4) The Cashbacks will be credited to the PhonePe Wallet within 24 hrs. 5) This offer starts on 11th October 2017 (15:00 Hours) and will be valid till 30th November, 2017 (23:59:59 Hours). 6) If the offer overlaps with any other existing offers, the maximum of the offers is applicable. 7) PhonePe has the right to amend the terms & conditions, end the offer, or call back any or all of its offers without prior notice. 8) Cashback can be used for recharges, bill payments, merchant transactions across PhonePe. 9) Cashback credited to a user cannot be withdrawn to any linked bank account or transferred to other users.